Shure N44-7z Stylus. Stylus Type Spherical. Why people choose Bop DJ. Great stability and designed not to skip even under the most demanding circumstances. Stylus Type: Round. This bundle includes Weight Not Specified. The N44G is a versatile performance needle, appropriate for both intensive scratching and mixing. N44G Stylus. Only a few hours use ripping vinyl to MP3. Also included is an Audio Technica Headshell. I have done a short video showing in use, still has protective bar under stylus, never removed. Engineered for scratch DJ’s and turntablists, the M44-7 is designed not to skip under even the most demanding circumstances. Authorised UK dealer for. Skip Resistance: ultra high. Why use us?. 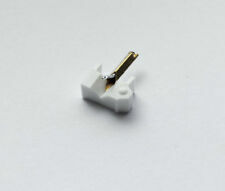 Atrylogy N44-7 Stylus (for Shure M44-7). Great stability and designed not to skip even under the most demanding circumstances. Stylus TypeSpherical. Why people choose Bop DJ. Our product SKU5604. 4 x Shure N44-7 Genuine Phono Stylus For M44-7 (Brand new, Unopened). Purchased brand new from Juno Records last year. Delivery will be by Royal Mail Special Delivery. Tested and in fully working order. Nice high quality Technics Headshell. Shure N 44-7 DJ M 44-7. Numéro de pièce fabricant N 44-7 DJ. This stylus has SPHERICAL tip. Shure N44-7 M 44-7. This stylus has SPHERICAL tip. 2 pcs STYLETS. Type 2 pcs Stylets diamant sphérique. Type Stylet diamant sphérique MADE IN JAPAN. Shure N44-7 M 44-7. FRANCE FOLLOWED WITH. IDENTICAL TO THE ORIGINAL. Shure N 44-7 M 44-7. This stylus has SPHERICAL tip. IDENTICAL TO THE ORIGINAL. Type Stylet diamant sphérique. Shure N 44-7 M 44-7. This stylus has SPHERICAL tip. IDENTICAL TO THE ORIGINAL. Fully working order. Good condition hesdshell. Shure N44-7 M 44-7. This stylus has SPHERICAL tip. IDENTICAL TO THE ORIGINAL. This is the great glow in the dark version. Shure N 44-7 DJ M 44-7. Numéro de pièce fabricant N 44-7 DJ. FRANCE FOLLOWED WITH. IDENTICAL TO THE ORIGINAL. Shure N 44-7 DJ M 44-7. This stylus has SPHERICAL tip. Numéro de pièce fabricant N 44-7 DJ. IDENTICAL TO THE ORIGINAL. • This item is in preowned condition. W/ NEW Diamond Needle Stylus. One of the top choices of hip-hop DJs the world over, the M44-7 is perfect for intense scratching. Even though it’s easy on your records, the M44-7 refuses to skip out of the groove. I will look it for you. The stylus is original Shure white. There is no need to put extra weight on these. The best setting is having the counter weight flush with the back of the tone arm like the last picture I provided. Two Shure M44-7 in very good condition. All accesories included for one of them. The other one, mounted in a headshell. Both without the needle protection. Japan Usage Item. I'm Japanese living in JAPAN. You need to get an import permit from Ministry of International Trade and Industry tog get your item if your item is more than 1000 MXN. I correspond from the bottom of my heart. Pro Turntable Scratch Needle. Get it now before they are gone. Helpful Links. The head shell have the whole for adding the 2 or 4 gram weight. Condition is Used. >>Shure N44-7 Specifications<<. The needle of choice for many champion DJ's worldwide. Engineered for scratch DJ's and turntablists, the M44-7 is designed not to skip under even the most demanding circumstances. Cleaning Brush. Mounting Hardware. In-hand and ready to go! Das PEP S-44-7 ist ein Nachbau der nicht mehr erhältlichen Shure Ersatznadel N 44-7. Die Nadel ist passend für die Shure M 44-7 / M 44 MB Tonabnehmersysteme und wird in Deutschland hergestellt. Features PEP S-44-7 Ersatznadel passend für Shure M 44-7 & M 44 MB Tonabnehmer Beste Tonqualität Made in Germany Material: Diamant, getippt Schliff: sphärisch Empf. Auflagekraft: 1,5 - 3,0 g.
If you have any warranty problems, we will support you. Also we are not be able to responsible for early failure. We are not sure if you can use in your country and can't be able responsible for it. SHURE N 44-7 DJ ,M 44-7. 2 pcs STYLETS. VENDEUR PRO EXPÉDITION RAPIDE ET SOIGNÉE. IDENTIQUE A L'ORIGINAL. Whether it's a scribble scratch, an orbit scratch, or any one of a number of different variations, with the Shure M44-7, DJs can go hard on the decks without having to worry about skipping or breaking the stylus. No longer in production, eBay nevertheless offers a range of highly sought-after Shure M44-7's, from a number of different sellers, at a variety of affordable prices. Why choose the Shure M44-7? A standard, stock turntable cartridge and stylus may be able to accurately reproduce the sound of your vinyl records, but it will not stand up to the rigours of scratching, backspins, and other performance DJ techniques. A standard cartridge and stylus will break, which will not only stop a turntablism performance right in its tracks but also cause damage to your records. This is why serious turntablists need a cartridge and stylus that is specifically designed for scratching. For years, the Shure M44-7 has been the unit of choice for demanding turntablists who are particular about their gear. What accessories are available to be used with the Shure M44-7? Shure M44-7 with Technics headshells. Shure M44-7 with chrome headshells and auxiliary weight. Why was the Shure M44-7 discontinued? It's pure economics: the advent of digital emulators that allow producers to "scratch" has caused a sharp downturn in the demand for professional-grade turntablist equipment. Shure has discontinued the M44-7 because they cannot maintain their quality standards while making a profit. To this end, the Shure company stopped production in the summer of 2018. Is the Shure M44-7 only for DJs? Although it's specifically designed for scratching, the Shure M44-7 can be used with any audio set-up. The stability and balance of this cartridge and stylus help it produce a sound that has been described as being "bright" and "punchy". If you've already invested in a serious turntable and amplifier, the Shure M44-7 is the cartridge and stylus to match. Content provided for informational purposes only. 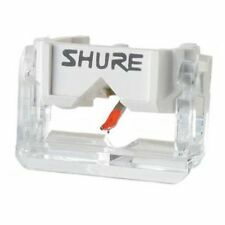 eBay is not affiliated with or endorsed by Shure.